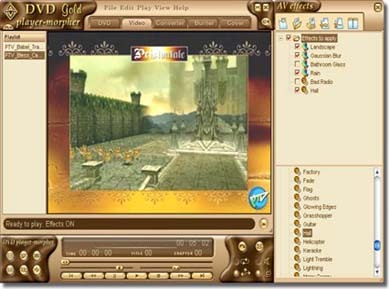 AV DVD Player Morpher Gold is the versatile DVD editor software that can morph movie live or to new video file. You can make new movie by adding video and audio effects and save in video format. AV DVD Player-Morpher has a DVD/video converter to convert movie from DVD to video for better storage. In AV DVD Player-Morpher you can import subtitle file via subtitle editor, or you can add text and edit your own subtitle. AV DVD Player Morpher Gold also works as a DVD jukebox, which plays movies in DVD, SVCD, VCD, AVI, MPG, MPEG, QT, MOV, M1V... It also include image capture, video and audio renderer, and a wide range of navigation access to movie playing. This DVD software also includes a VCD burner which can copy video file to CD as well as erase a video CD. After having your self-made movie copied to CD, you can use CD cover editor to make label, inlay, and cover for it. The Gold edition includes 44 video effects and 44 audio effects, capturing series image ability and more conversion formats.